Is There Hope at Last for Apostolos Andreas? SUCCESSIVE plans to renovate Apostolos Andreas Monastery in occupied Karpasia date back years but have all stumbled over who is to administer and fund the project. In the meantime, one of the most important Greek Orthodox religious sites in Cyprus is quite simply crumbling, becoming more dangerous with every passing year. Eight months after a renewed push to reach agreement on the historic building, discussions with the United Nations and the Church of Cyprus are finally drawing to a close, the co-chairman of the bi-communal technical committee on cultural heritage, Takis Hadjidemetriou, said this week. He said the United Nations, the Greek and Turkish Cypriot members of the bicommunal technical committee have all agreed and were “formulating the terms of the endeavour” with the church. “The road is open,” the former EDEK MP said. Built in tribute to Apostle Andrew, who was said to have set foot on Cyprus on this section of the rugged Karpasia coast, most of the monastery’s buildings hail from the 19th century but the church itself is about five centuries older. In 1966 a series of concrete-reinforced upper rooms were added to be used as guesthouses. These were too heavy for the older building beneath to support and severely weakened the overall structure. Add to that the decades of neglect since the Turkish invasion and the need to renovate is now absolutely crucial. Getting all sides to agree to the same thing at the same time has so far been unsuccessful, however. An early plan formulated in 2003 by UNOPS (UN office for Project Services) and to be funded by US funds aimed to demolish the 1960s upper rooms, but Greek Cypriot politicians disagreed with the plan and rejected the offer. In 2005 and 2009, announcements that work would start following a Patras university study proved untrue when disagreements arose over who would administer the project. Other efforts to restore the complex have also failed, sometimes because the church felt it would be forced to give up ownership. 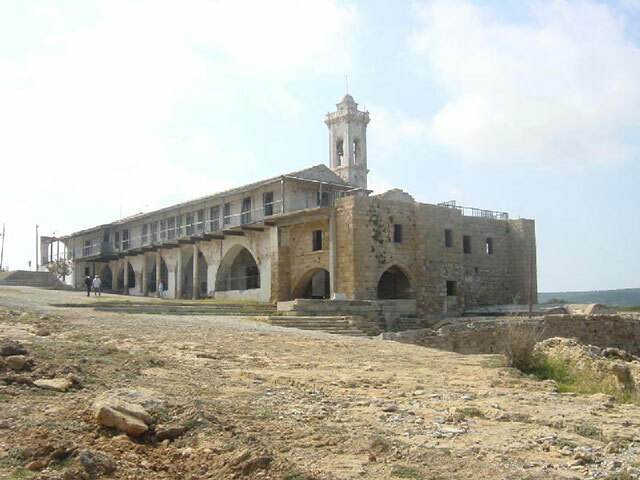 In 2010 for example, Archbishop Chrysostomos II rejected UN suggestions to let the Turkish Cypriot religious organisation, EVKAF, to oversee the restoration of the monastery because he viewed it as tantamount to the church giving up ownership of the monastery. “I was very categorical that I would rather see Apostolos Andreas collapse and will never accept that this monument belongs to EVKAF,” he said in November 2010. The primate said that authorities in the north have “constantly obstructed the maintenance” of the monastery in order to destroy Greek and Christian heritage. But in February, the technical committee announced that a restoration of the monastery based on the Patras university study would start. The bicommunal technical committee was created in April 2008 to protect the island’s cultural heritage and has since renovated religious monuments on both sides of the divide, including the Ayios Armolaos church in Kyrenia, the Saint Mamas church in Lapithos. The Tophane Mescit mosque and the Akaki mosques in Nicosia are being fixed and 11 projects are forthcoming, said Hadjidemetriou. “The United Nations Development Programme (UNDP) asked for three things in March - a timeframe, cost estimation, and a plan - which we’ve delivered admittedly with some delay in October,” he said. The committee is now ready to proceed with a two-year endeavour costing €1.1 million to fix the church but is waiting to see what the UN guidelines are in relation to the question of the church funding the restoration, Hadjidemetriou said. “The UNDP Partnership for the Future is ready to proceed on the assumption that the church will provide the funds,” Hadjidemetriou said. But even if the church decides it does not have the funds, the committee will carry on regardless, Hadjidemetriou said. “We don’t want the project to be delayed. If the church tells us they have no money then we can include Apostolos Andreas in other projects for which we have funding or get European Union funding,” he said. “We’ll find a way,” he said. But are all the previous delays an ominous sign for Apostolos Andreas monastery? THE ARCHBISHOP yesterday reasserted his readiness to let the historic Apostolos Andreas Monastery in occupied Karpasia collapse rather than sign onto any plan that does not state that the Church of Cyprus owns the site. “I’ve said it before that I would rather see the monastery collapse than let go of the property. The monastery is ours,” Archbishop Chrysostomos II said. He was talking to state broadcaster CyBC, which asked him to comment on an announcement made this week by the ‘TRNC’ saying they would fund a project to fix the complex’s church alone, citing delays on the part of the Greek Cypriots. After decades of neglect following the 1974 Turkish invasion, the monastery complex now needs to be renovated. However, efforts to get all stakeholders to agree have so far failed. The Primate yesterday blamed the bicommunal technical committee assigned to protect the island’s cultural heritage. “I’m sorry to say that this bicommunal committee has done nothing. I can say its stance has been negative rather than positive,” the Archbishop said. The bicommunal committee was created in April 2008 and has helped in seeing through the renovation of religious monuments on both sides of the divide, including the Ayios Armolaos church in Kyrenia, the Saint Mamas church in Lapithos, and has been fixing the Tophane Mescit mosque and the Akaki mosque in Nicosia. It has also been co-ordinating Apostolos Andreas’ restoration efforts for the past year. But the Church has refused to agree because a document prepared by the United Nations Development Programme names them only as donors. “If we make a mistake, they will make out as if the monastery belongs to EVKAF,” he said referring to the Turkish Cypriot religious foundation. It was in 2010 when the UN suggested that EVKAF could oversee the site’s restoration that the Primate originally said that he would rather let the monument collapse than forego ownership. The co-chairman of the technical committee Takis Hadjidemetriou issued an announcement clarifying that the UNDP was following protocol differentiating between donors and owners. The UNDP “has globally signed similar documents in thousands of cases and it surely could not change them in the case of Apostolos Andreas,” he said adding that the signature of the owner – in this case the Church – would anyway be necessary for when tenders were proclaimed. “What we can say today is that if those responsible in the Church displayed a spirit of trust and cooperation, the monastery’s restoration project would be at a far more advanced stage today,” Hadjidemetriou said. But the Archbishop expressed concerns over the intentions of the ‘TRNC’. “I don’t know what their plans are, if they plan to clear the space to build a hotel, I don’t know. And this situation worries me,” he said yesterday. But he added, “we insist that the monastery is ours; we will not back down on this point”. WHO IS to blame for the latest standstill in efforts to renovate the historic Apostolos Andreas Monastery, is less important than pushing ahead with its renovation, Foreign Minister Erato Kozakou-Marcoullis said yesterday. Journalists asked Marcoullis to comment on recent developments which are impeding renovation efforts at the monastic complex in occupied Karpasia, at the end of a discussion on Cyprus’ recent presidency of the council of the EU. “I am not going to rush in to blame anyone; our effort is to continue the ministry’s collaboration with the church, the technical committee and the United Nations Development Programme,” Marcoullis said. The Archbishop recently blamed the bicommunal technical committee assigned to protect the island’s cultural heritage. He took issue with a standard procedure by the United Nations that named the church as donors to the restoration project, but did not state that the Church of Cyprus owns the site. The primate said that he would rather see the monastery collapse than let go of the property. The technical committee said that the UN Development Programme was following protocol differentiating between donors and owners, and could not very well change procedure in the case of Apostolos Andreas. The technical committee, that has successfully restored a number of other religious sites, said that the much needed restoration programme would be already underway had the church “displayed a spirit of trust and co-operation”. The monastery complex is in urgent need of repair and has been neglected for decades since the Turkish invasion in 1974. “I will take initiative in the next few days to find a way forward on this issue because as time passes so do the dangers increase for the monastery,” Marcoullis said. She said she would be collaborating with all stakeholders so that renovation works could start as soon as possible.